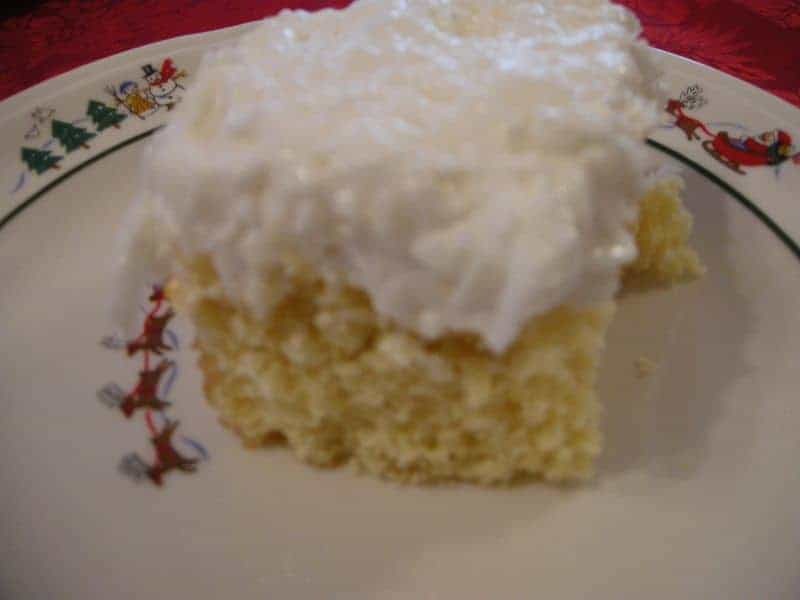 This is my Dad’s favorite cake at Christmas time and Easter and its just divine beyond compare. 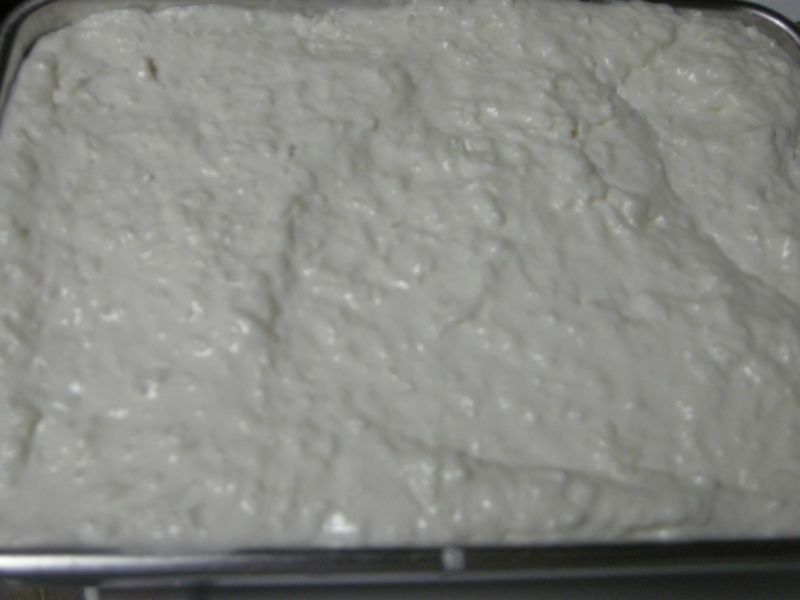 Another great refrigerator cake, it can be made three days ahead of time and then left to sit in the fridge as it just grows moister with every passing minute. Coconut around the Holidays is a tradition in the south, especially coconut cakes! Back in the old days that was the only time of year you could get such an exotic thing as coconut in these parts (well, in Alabama anyway!). Stay tuned later today when I am going to post a Christmas menu that will let you entertain a house full of guests with no virtually cooking and no takeout! Y’all, this tutorial is what my photos look like when I bake after dark! Sun makes the best light and without it, you get…well this! However, I think you can still tell how yummilicious this cake looks so use your imagination and let the rest be well lit and high grain! (including gift mixes), click here! First, you’re going to need to bake a yellow cake. Just get a boxed mix like I do or use your favorite recipe. The cake isn’t that important as the icing is our key player here. I used a yellow boxed mix and made it according to package directions. Now, while that is warm, we need to assemble our icing. You’ll need: Coconut, whipped cream, sour cream, and sugar. Place all icing ingredients in a mixing bowl. Poke holes all in warm cake with a fork. Let cake cool for about ten minutes and then pour icing over it (it will still be warm). Spread over, cover, and refrigerate! You can make this as a layer cake but I find it is much easier to deal with (and store in fridge) as a sheet cake. Prepare cake mix according to package directions in a 9x13 inch pan. 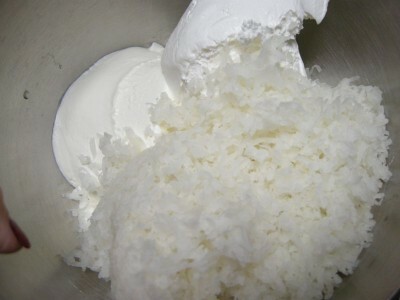 Combine sugar, sour cream, whipped topping, and coconut. Blend well and chill. 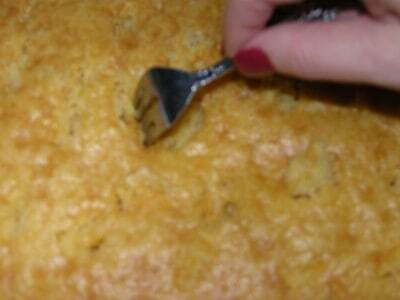 Poke holes all over top of warm cake and pour icing mixture over cake (after it has rested in pan about ten minutes). 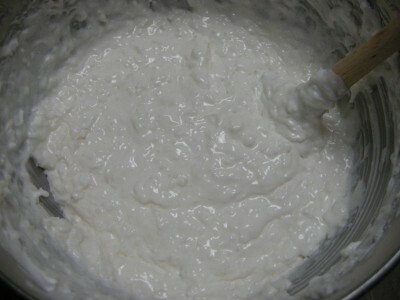 Cover well and refrigerate 1-3 days before serving. Store in refrigerator. I am behind on emails, comments, and sending recipes out! I wanted to thank y’all for being so understanding! So much to do and this is the only time of year a lot of these things happen. The kids are having a great time and I’ll get caught up after Christmas! Love y’all! Southern Beauty Magazine Giveaway Winner! How To Feed A Gathering, Enjoy Yourself, AND Have A Clean Kitchen! The candy cane idea is great, it would be SO PRETTY!!!!!! I just love your food! just emailed this to you so you’d get it sooner! I think the cake would work great as a bowl cake like you described! Its so amazingly good and that recipe gives you lots of frosting so yes, go for it! Let me know how you like it, okay? Coconut must be a dad thing because my dad loves that cake too, we just leave out the fact it contains sour cream which my dad despises. I’m brand new to this site and loving every single minute and recipe. I think your daddy might be related to my father-in-law. He hates sour cream but loves food that it’s in (as long as he doesn’t know). But, heck, y’all he hates MAYONNAISE (he’s a true yankee)! ‘course he LOVES devilled eggs. Wonder what he thinks goes in them. LOL! 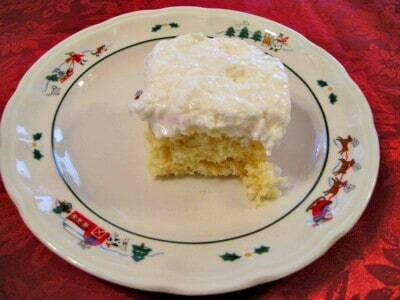 Mmmm… There was always a coconut cake as one of the many sweets at my Maw Maw’s house, too! That and Martha Washington candy are the main things I remember! She and my aunt would bake for a week before Christmas and fill up a spare bedroom with cakes, pies, and candies! Love the new site but, if you could, please put the link to the recipe in the email…I like to save the mark these pages in my favorites. Used to be a link…Thank you so much. Your site is wonderful and you have been fortunate to get web mention and advertisment. I hope you have a great Christmas Christy and your family!!! It’s Christmas Eve today, and I’m about to go out shopping! Not that I’m disorganized, but you see, on Christmas Eve everything gets marked down because we have another holiday the day after Christmas, I’m sure you would approve of that! I’m hoping for some of those yummy boxed chocolates. Yum: this looks so sweet! Mary’s sentiments are mine exactly. It is just sooooooo much easier If I don’t have to go to the browser & then search andddd ohhh you know what I mean. Can’t wait to make this cake! If you could, please put the link to the recipe in the email…I like to save the mark these pages in my favorites. Used to be a link…Thank you so much. Your site is wonderful and you have been fortunate to get web mention and advertisment. Hey! I will do my best to remember that! I do all of my emails manually now (I pay for a service to keep up with email addresses and to send the email itself out but I input the actual post manually so no one gets spam) and I often forget little things. However, anytime I send an email out, that recipe is always on the front page of SP, if that helps!! I will try try try to remember to put a link to the specific recipe in the email though! thank you for your help! I made this for Christmas, and we all really liked it! It turned out just wonderful, yum!! This recipe is wonderful…I usually make it in layers because that’s how the recipe was given to me. However, I will not start making it as a layer cake – definitely much easier to store. Thanks for that tip. 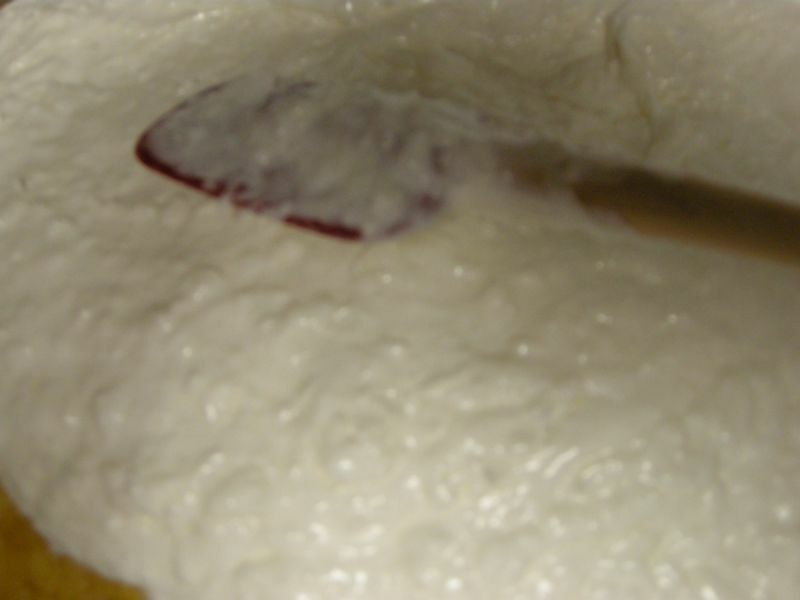 Even people who don’t like sour cream, LOVE this icing. I have this same recipe on my blog as well. Mine was my great grandmothers recipe and my fav also. I served this cake to the ladies at my Monday evening Bible study. We put dollops of lemon curd on it, and it was just divine! I have had requests to make it again and again and again… Thanks for the great recipe. I am so very glad I found your site. I love everything about it. And I am going to make this cake to night. Made this for our church Christmas potluck. It was a HIT! Thanks so much for your efforts in helping us southern girls learn to cook like our grandmas! After you poke the holes, you cook it some more?? For ten minutes? Do you put anything on it first?? This looks delicious! Anna (if you’re still around), I think Christy might have made a typo under the photo there. Instead of “cook” I think it should read “sit.” It does look yummy. I’m debating making it for Easter! I was reading the part where you pour the icing on and instead of saying let cake cool about 10 min. it said let it cook. Hi there and thank you for all the great goodies to try for Easter!! One question on this cake (frosting): Is is regular granulated sugar or powdered sugar? Thanks for asking! It’s granulated. Hope this helps! Kenz asked a good question about the sugar. I was wondering if you could use Splenda (or the generic) in the frosting recipe. Hey S, I’ve never used Splenda but I think it would work just fine in the frosting. If you try it, let us know! I’m always looking for more ways to use my Splenda!!! I’ll probably try it for Easter Sunday. By the way, I heart the Christmas plate in the cake picture! Hi Christy, I made “Daddy’s Coconut Cake” yesterday for Easter and it was delicious! The frosting is so good! My dh and I are new to Virginia, USA and love all the southern food specialties. I usually stay with my standards but I love to try new recipes. Keep up the good work and God Bless! 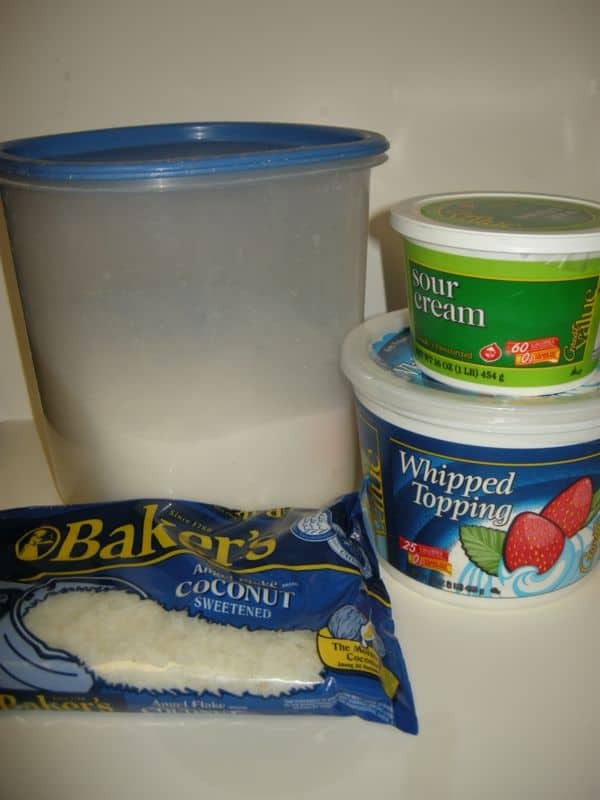 This sounds jsut like how my Granny Granny makes her Coconut Cake!! It is sooo good. She does make hers in layers though…. But either way, it is so yummmyyy!! Thank you! Hey Christie – Did you get my message that I have a red casserole (1 1/2 qt., I think – Pyrex) with a lid that’s in good shape – I’d love to send it to you if you’d like to have it. Let me know!! It’s funny that you would post this recipe at this time. I just made a layer cake similar to this one for a friend to give her mother-in-law along with her Mother’s Day gifts. I got an e-mail this week telling me that although she and her husband didn’t get any of it, her brother-in-law and his wife were there on Mother’s Day and she was told they all ate two pieces each and then the brother and his wife asked if they could have some to take home. She said they thought it was the best coconut cake they had ever eaten! It had been sitting in the freezer for over two weeks so had gotten good and rich. I make yellow layers and split them then frost them with the filling (not adding the whipped topping yet) and then add some of the filling to the whipped topping to frost the whole outside of the cake. I’m not a huge coconut cake fan but I have to say I will be happy to eat this one anytime…Ummmmm! Ummmmm! Good! In fact, I just got home from the grocery store and got the ingredients to make another of these cakes to give to my friend since they didn’t get any of the other one. My fam doesn’t do coconut, I bet this would be good with crushed pineapple as well. Looks so good! Christy- this one is a family favorite..like all the rest of your recipes!! thank you ! 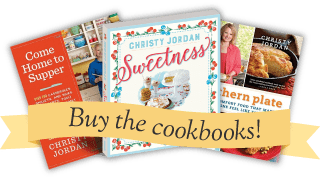 I pre-ordered 2 of your cookbooks..can’t wait for them- and I have to share!! I can’t find out how to do it without everyones comments printing out.